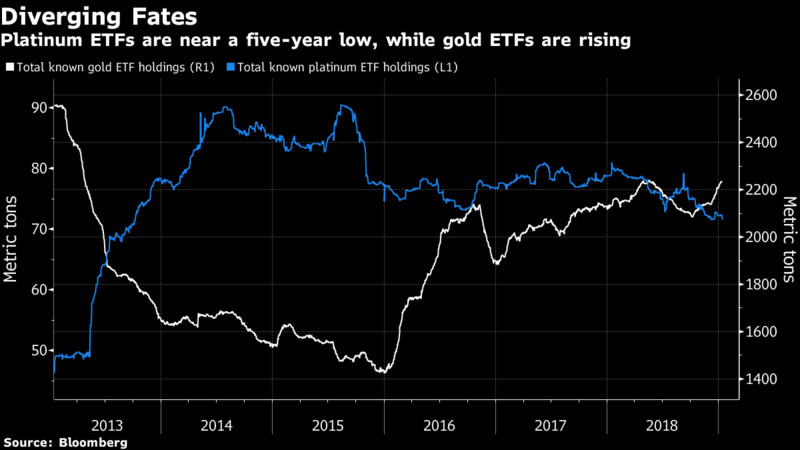 While investors have poured into gold funds, they’ve deserted platinum, which has fallen out of favor amid shrinking demand and excess supply. The possibility the trend reverses even slightly represents a buying opportunity, Johnson said in an interview from Newport Beach, California. With $1.72 trillion under management as of September, Pimco is one of the world’s largest bond managers. Platinum was the weakest of the four major precious metals last year as environmental concerns reduce demand for diesel-powered automobiles. By contrast, equity market turmoil and an increasingly dovish Federal Reserve have supported gold and silver, while palladium has benefited from its use in vehicles that run on gasoline. 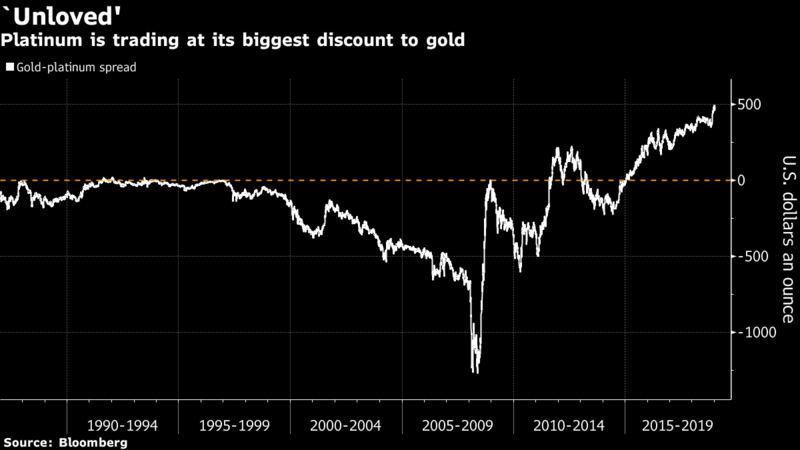 Gold’s premium over platinum hit a record at the start of January after a rally in the last quarter of 2018 pared its annual decline to just 1.6 percent. Holdings in bullion ETFs are near the highest level since 2013 as speculation grows the Fed may ease its tightening pace or even pause in raising interest rates. Meanwhile, holdings in platinum funds are close to a five-year low. Being a much smaller market, even a marginal shift in flows from gold funds could have an outsize impact on platinum prices, according to Johnson. The same is true for use in jewelry, he said. Spot platinum traded at $800.12 an ounce on Wednesday, not too far from the lowest intraday price in a decade, and gold was at $1,290.65 an ounce. While bullion could still climb above $1,400 this year if interest rates trend lower or investors flee risky equities in search of a haven, Johnson says it’s fairly priced or even marginally overvalued by a few percent. “Platinum is a more compelling metal to own than gold,” he said. The likelihood that the market will remain in surplus this year, albeit a smaller one, should temper bullish expectations. The World Platinum Investment Council estimated in November that supply will outstrip demand by 455,000 ounces in 2019, down from 505,000 ounces in 2018. But it still sees consumption rising about 2 percent, driven by industrial usage and investment flows. Johnson isn’t alone in being bullish on platinum. There’s upside to the metal’s prices as a weaker U.S. dollar and lower Treasury yields will be supportive, while Chinese jewelry demand is expected to bottom out, according to ABN Amro Bank NV, which sees prices averaging $938 in 2019. Platinum is also near a record discount to palladium and there’s been some speculation it could be used as an alternative in gasoline engines. While Norilsk Nickel PJSC, the world’s biggest palladium miner, says that’s unlikely because it would take at least two years and require additional work and cost, Johnson says the switch makes sense on paper. Another precious metal of interest is silver, which has similar functions as a store of value but is much cheaper compared with gold, he said. In April 2011, gold was about 32 times more expensive than silver while today it’s a multiple of 83. The white metal traded at $15.54 an ounce on Wednesday.